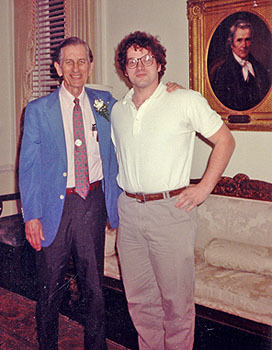 Professor Thomas Hammond was one of my faculty advisors while I was in graduate school studying Russian history at the University of Virginia. Here we are standing in one of the colonnade clubs along the main lawn at the University of Virginia--we certainly had contrasting styles, appearances and values. I think that this picture was taken just before his formal retirement party. Some details about T. T. Hammond (Most of these are from my recollections of what he told me. There is also some biographical information from the UVa Archives). Thomas Taylor Hammond (1920-1993), was professor of history at the University of Virginia from 1949-1991 and founder of the UVa's Center for Russian and East European Studies. His main teaching and research focus was Soviet foreign policy, especially with respect to communist takeovers. At the University, he was largely responsible for building a pretty comprehensive program of Russian studies encompassing a number of academic fields including economics, government, international affairs, languages, literature, music, etc. He earned his B.A. at the University of Mississippi in 1941 and then a master's degree in economics at the University of North Carolina. He served in the US Navy in the Pacific in World War II, and I remember his saying that he was on ship preparing for the invasion of Japan when the war ended. After the war, he taught history at Emory University and then at Louisiana State University. I am not exactly sure what prompted him to go back to grad school to study Russian history, but he went to Columbia University's Russian Institute (M.A. 1948, Ph.D. 1954)--really the only place to study Russia at that time. Then he got lucky. I am not sure of the exact details or sequence of events, but somehow Dumas Malone, the Jeffersonian scholar who was a friend, arranged an interview for him at the University of Virginia, and I remember Hammond saying he drove all the way down, interviewed and then had the job. During the civil rights struggles of the late 1950s and early 1960s, Hammond, along with Professor Paul Gaston, played an active role in helping to integrate the Charlottesville Public Schools. See, Public School Desegregation: Charlottesville, Virginia, 1955-1962. I still remember my first meeting with Mr. Hammond--We usually just called him "Hammond" or "TT." It was advising day, or something to that extent, for new history graduate students back in the fall of 1984. You were supposed to show up in Randall Hall, a creaky old building off the main lawn, where the department of history was. There were three of us (myself, Jeff Tayler and Susan Peterson) who were starting with an intended major in Russian history. We sat in the hallway outside Hammond's office waiting to meet him and get our schedules for the fall figured out. Hammond could be a pretty formal and formidable figure, and we just sat there staring nervously across the table from him. The office was stuffed with papers and books, and had that slightly stale, musty smell of not having been aerated in a few months. There were piles of stuff everywhere. No air conditioner. I think that Susan Peterson and I were in his office at the same time--Jeff having already finished--and Hammond made this phone call down to Professor Lenny Berlanstein about some social and labor history course and whether it would be of any use to us majoring in Russian history. Berlanstein said it might be helpful, and so Hammond signed us up--What a disaster that course turned out to be! In general, it was pretty scary visiting a lot of the older professors in the department. Some of them could be very formal, and it was hard to have an extended conversation with them--they had things to do. Hammond, himself, was extremely tough, with a very proper Southern demeanor, and always dressed with a sport coat and tie. He was insistent on specific details, for instance, the UVa Honor code, and he had a hard time getting used to my somewhat informal dress. I once had a small conflict with him over the University's honor code. He required that every student always write out on the front page of a blue book exam the phrase, "On my honor as a student I have neither given nor received help on this exam, " (or something like that) and sign your name. I thought that it was pretty ridiculous, and I actually felt the entire honor system was stupid since only students could bring charges of an honor code violation and only students could judge students. Anyway, I thought that maybe for eighteen-year-olds this thing was OK, but I wasn't going to write out the stupid pledge. I had no problem signing my name to something, indicating that it was my work, but the pledge, no way. I remember going round and round with Hammond about this when he didn't find the written pledge on one of my exams. I honestly, don't remember how it all turned out, but it couldn't have been good. I was taking his course on Soviet foreign policy, and since I was a graduate student I was supposed to write a major paper. Well, I went overboard and decided to write using only primary sources, both Russian and English, to document the Ethiopian revolution of the mid-1970s and the role of the Soviet Union in trying to create a Marxist regime there. I did a lot of work and literally scoured every available Russian source for information. I handed in the paper about a month before the end of the spring semester, and about two weeks later, I was summoned to Hammond's office and told that he had only gotten about ten or so pages into the paper, that the paper was so badly written that he could not read it and that I would have to re-write it. Well, this was still in the day of the typewriter. So that meant a lot of re-writing and re-typing which was not good since I was a slow, two-finger typer, and everyone of the pages had footnotes--Hammond did not accept endnotes. So, I got a revised copy to him, and I recall that while we were taking the final exam, he was sitting up there, reading something and wincing as he read. Well, that happened to be my paper, which got returned to me as still unreadable; he had gotten to about page three this time. Hammond said that he would give me an incomplete and allow me to work on the subject over the summer. I did some more research, and really worked on my writing, making sure that there were clear headings and sub-headings, making sure that my paragraphs were all clear and ensuring that everything was done according to Turabian's Manual for Thesis Writers. Took me most of the summer, while fixing and retyping a few pages a day. The final version came out to about 95 or so typed pages. What an immense amount of work, and Hammond thought it was great and gave me a 98, telling me that it was one of the best graduate papers that he had ever read. Now, in that regard, while I was caught up with this Ethiopia paper, I was constantly checking back with Hammond to see if he had read my paper, etc. One time he recounted his experiences with Geroid Robinson at Columbia University. Robinson was one of the legendary pioneers of Russian studies in the United States and author of one of the most respected Russian history books, Rural Russia under the Old Regime. Anyway, while at Columbia, Hammond studied under Robinson, and he recounted how he was very interested in the fate of his M.A, thesis, which he had handed in to Robinson sometime in early January. After a while, he asked Robinson when he would hear something, and Hammond recalled that Robinson responded with something like, "Oh, I couldn't possibly read it before June." I always considered Hammond a Cold War warrior, one of the numerous academics who had lived through the Cold War and always thought of it in terms of a war with the Soviet Union. There was a whole generation of these professors who had started teaching about Russia in the 1950s. Even though they could be very meticulous in their research and fair in their study of the Soviet Union, there was always this air of fighting the war about them. They wrote a lot--Hammond published literally hundreds of articles in scholarly journals--and they had no rosy illusions about Russia as a communist country. Hammond traveled there often, including in 1958 for his path-breaking article that appeared in National Geographic September 1959--definitely worth a look. That was the first major article on Russia by National Geographic since World War II, and the magazine had contacted Hammond to go there, take pictures and then write the article--Hammond was an excellent photographer. As one of the generation of Cold War scholars--and one of the oldest--Hammond was connected with everyone. He always brought lecturers to the University, and he was familiar with all the major policy experts and could call or contact anyone. He was recounted to me how he had badgered Aleksandr Kerensky after a lecture, questioning why he had not seen the Bolshevik threat and why he had undertaken the "Kerenskii offensive." He very much regretted having done that to Kerenskii. I did a lot of work for him over the years, both academically and manually. For a while, I had a work-study assignment, and I worked for Hammond. I would keep his newspaper files up to date. It was nasty work, cutting up newspapers and filing the articles by topic, and Hammond was especially particular about how he wanted it done. I also did a lot of work compiling for his classes an extensive bibliography on Soviet foreign policy in the non-developed world. By about 1988, I'm guessing that I had about 75 pages of articles and books in the bibliography, but we never got it published or did anything with it. I still have a copy of it in WP 4.2! Hammond had been increasingly interested in Soviet behavior in the Third World, which was the term that we "used" back then, and this saw reflection in his book on the Afghanistan coup (see below). Hammond worked very hard on that book using his diplomatic and academic contacts, and he became very adept at using FOIA (freedom of information) requests to pry out secret government and intelligence information. After the work on Afghanistan, Hammond turned attention to the Grenada invasion. I know that the book never appeared, and it might be lost now depending on what kind of software Hammond was using back in the 1980s--I know that it wasn't Word or WordPerfect--might have been Wordstar. It was kind of interesting that Hammond made the transition very quickly to using the computer when word processing software was just becoming available. I also did grading for Hammond in his Soviet foreign policy courses. That was not as easy, since he had pretty clear rules about what he expected for answers on his tests. He would go over specific points for the test answers, and then he would review all of my grades to make sure that the exams were graded properly. I also did a lot of work around his house for him on Jamestown Drive, cleaning out weeds, planting bushes, cleaning gutters, cutting the grass--He had that zoysa stuff in the front yard. Once I trimmed his azaleas out front in what I thought was an interesting and unusual bare-boned pattern, he was slightly bemused, "What have you done?" Then there was the time that I chopped down a tree (about 6") and misjudged the tree's location with respect to the house--it was on the hill in the backyard that sloped towards the house--and the tree crashed down on his roof with a very, very loud thud, bringing him racing out of the house to see what had happened. He also had this storm drain off to the north side of his property that he was always worried about me throwing debris in it--I never did, but his neighbor did which must have irritated him to no end. Every summer, Hammond and his wife, Nancy, would pack up their Isuzu Trooper and head up to Nantucket, 14 Derrymore. I'd help load and then unload when he came back in the fall. I'd also keep track of his house and lawn while he was gone, and do any library research that he needed during the summer. Hammond was in Nantucket when my dissertation defense was scheduled. Since he was on the committee, and since he didn't want to come back to C'ville, we set him up on the speaker phone. That was a crazy experience, sitting around the table (Hans Schmitt, Walter Sablinsky, Mark Elson and myself) talking about my dissertation--I was very nervous because I was never quite sure that they would accept it--and Hammond would chime in with something across the phone. After they discussed some things in private, I was told that the dissertation was accepted as long as I strengthened my conclusions, although I was never sure what they meant or what I really changed there. When Hammond retired, someone held a huge retirement party, and scores of his former students who had become professors or gone on to work for the government attended. He really had produced a lot of Ph.D. students in the forty or so years that he was at the University. He took that opportunity to say some very nice words about my achievements as a grad student. Hammond, if you could get beyond that very imposing southern aloofness, could be extremely nice--I am sure that he never had any idea of how imposing he could be to his grad students. He was always very nice about finding me some odd jobs so that he could pay me something, but he was always very correct about what he paid me. He did have me over to dinner once or twice, and he also had my wife and I over to dinner before we got married. He could be very pleasant, but we weren't going to sit down and drink some beers and have a pizza. He had this large photo of himself and a bluefish hanging in his kitchen. It was a large bluefish--fierce expression--that he had just battled to shore up in Nantucket, and the wind was whipping the ocean and Hammond's hair. It was a great photo, filled with life and the elements, and I remember his looking at that and telling me how much fun it had been battling that fish. Sometime before I arrived in grad school, Hammond's health had taken a turn for the worse, ulcers or something, so that he didn't have as much strength to stand and lecture through a full class. Gennadii Skliarevski was just finishing his Ph.D. then, and he he would help Hammond out with some of his lectures. Because of that health problem, Hammond was always nibbling on some sort of food. When Hammond retired from the department, he had an awful lot of stuff to clear out of his office, and he had a pretty big corner office right at the top of the stairs in Randall Hall. He sold me a lot of his books--no real bargain there--and then he provided me with files and files of his notes and documents that he had accumulated over the years, such as notes for his Soviet foreign policy courses and his Russian history courses, knowing that I would one day be teaching Russian history. He also gave me some European history notes and some of his books, like the copy of Burns, Western Civilization that he had used when he first taught Western Civilization back in the 1950s--I have turned over a lot of the material to the University Archives--I also received about 50 or so photo slides. He had a huge slide collection and was a very fine photographer. I have used some of those slides in my courses. I have also used some of my Hammond materials in my courses.